Instagram’s vertical video hub, IGTV, launched last summer and has since seen several significant developments. 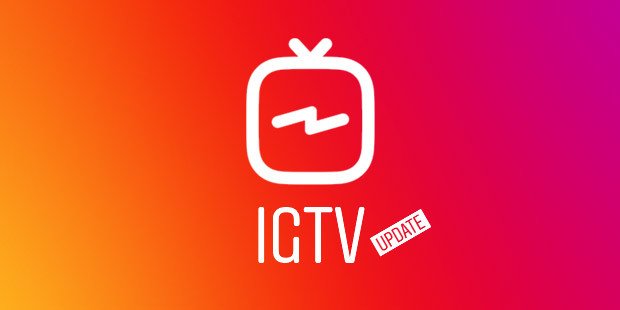 (If you need a refresher, read our initial report here for an overview of IGTV’s features and a walkthrough of its technical aspects.) This article looks at recent changes, and brings you up to speed on what you need to know. When posting to IGTV, you now have the option to also post a preview into your main Instagram feed if your videos are at least one minute long. Viewers of your feed will then see a one-minute preview of each IGTV video and can tap through to watch the whole thing. One slight drawback is that videos in preview will initially appear slightly cropped (to be specific, a 4:5 center crop). They will appear full screen once you tap the IGTV video link. Also worth noting—when selecting the option to make the IGTV video appear in your main feed, you can also post to Facebook. IGTV previews will also appear in your profile tiles—though you can delete them from your tiles while still keeping the videos intact on your IGTV channel. To get served IGTV previews from another user, you’ll need to already be following them. There aren’t metrics yet on whether previews will be served to followers at the same rate that a normal photo or video in a feed would. But here are the important numbers in all this: Since the introduction of IGTV previews into the main feed, IGTV video views have increased at least 300 percent for most users, and up to 1000 percent. There was an initial wave of excitement around IGTV’s release, but that enthusiasm has waned as many have found IGTV confusing—if they’re even aware of it. Originally touted as the vertical video answer to YouTube, the feature didn’t catch on quite as much as Instagram had hoped. The search functionality and navigation leave a bit to be desired; Instagram’s founders, who oversaw the rollout of IGTV, left a few months after its launch amid rumors that they’d had conflicts with executives from Facebook (which owns Instagram); and the service still doesn’t have a monetization option for creators who rely on revenue streams from social media. IGTV seemed like it could be a fun tool for all Instagram users to upload video, but its primary users have been almost entirely large companies or celebrities with preestablished followings, and even then the rollout has been rocky. The original IGTV launch partners only created an average of five IGTV videos each before they returned to focusing their video efforts on YouTube. A takeaway: Videos on IGTV currently tend to have high production values and slick editing, which most people don’t have access to. Putting IGTV video previews into the main feed is a way to build awareness, and hopefully to encourage more people to use the tool creatively. The barrier to entry of posting videos on IGTV seems high, since you can’t film a video from within the app. You need to either record a separate video on your phone, which you can then upload, or have the technical know-how to upload a nicely edited video through the Instagram desktop website. When IGTV first appeared, creators were uploading preexisting YouTube or Facebook videos sideways, so viewers would need to rotate their phones. This trend has mostly stopped. So, what should you be doing with IGTV? Swiping through the app, you might see segments from late-night shows, tutorials, news pieces, interviews, comedy skits, ads, and other beautiful videos that look like they cost a lot of money to make. But if you don’t have professional video editing equipment, the easiest thing to do is to record yourself talking to the camera, which is a tried and true way of engaging your followers. This could look like a mini-vlog, an announcement of a project you’re working on, a slice-of-life scene … anything you’d consider putting on Instagram Stories but want to be longer than fifteen seconds (as an example, look at Kevin Hart’s IGTV). The options are endless. The only constraint is that videos are capped at ten minutes—unless you’re a verified account, in which case videos can be up to an hour long. Richard Wylde is Senior Manager, Digital Video Strategy and Distribution at Penguin Random House.